Lyle Armstrong’s EMS career began in 1988 when he graduated from a Wyoming EMS First Responder Course with the aim of improving the safety of his local whitewater club. In 1989, he was hired as a career firefighter by the Rock Springs Wyoming Fire Department (RSFD). Over the next few years, Lyle responded to several incidents that inspired him to further his training and experience within the EMS profession. Lyle took an EMT Basic course in 1994 and began working part time for Vase EMS in Rock Springs. Lyle advanced to ALS by obtaining his Wyoming EMT Intermediate Certification in 1996, and continued to work part-time for Vase EMS for 10 years. Lyle always states that his goal is to be the best firefighter/EMT that he can be. Lyle’ career evolved as he served two years as firefighter, two years as fire captain, 14 years as Battalion Chief, and finally by serving almost seven years as fire chief. In the midst of his career progression, he also continued to advance his education, obtaining his Associate Degree in Fire Science and completing the National Fire Academy Executive Fire Officer Program. Lyle’s focus was to give as much back to emergency services as it had given to him. Lyle served as an adjunct instructor from 1994–2007 for the Wyoming Fire Marshal’s Office teaching hazardous materials awareness, operation, incident command, and technician courses throughout the state. Through the years, Lyle also served as an adjunct instructor for several of the Wyoming Fire Schools. From 2003–2014, Lyle ran a business providing training to the industry on firefighting, hazardous materials, technical rescue, and EMS. Lyle has also been active in many local leadership activities and committees. Lyle served as the City of Rock Springs Deputy Emergency Management Coordinator from 1993–1995, and Emergency Management Coordinator 1995–1999 and 2008–2015. Lyle was a member of the Sweetwater County Local Emergency Planning Committee from 1994–2014 and was the Chairman of the Sweetwater County Ambulance Service Board, Rock Springs from 2013–2014. The board was tasked to oversee the area’s medical transportation and successfully created, marketed, and executed a five-year ambulance contract. Lyle has also served in several state positions. As the RSFD fire chief Lyle also served as the administrator for the Wyoming Office of Homeland Security Regional Emergency Response Team 4. Lyle served on the Wyoming Fire Marshal’s Firefighter Certification Committee from 1999 to 2011, serving six of those years as chairman. During those six years, the committee was successful in obtaining NPQS (ProBoard) national certification of seven of the committee’s 17 fire certification levels. Lyle also served six years on the Wyoming Fire Chiefs’ Executive Board, with two years as president of that organization. Lyle also served on the Wyoming Fire Chiefs’ Legislative Committee from 2005 to 2014. On December 12, 2014, Lyle retired from the RSFD and moved to Del Norte County, California. Looking to continue his efforts to give back to the community, Lyle filled a vacant Board of Directors position on the Smith River Fire Protection District from July 2015–November 2016. Lyle also participates on the Del Norte County Office of Emergency Services Emergency Operations Center team and was hired as a part-time EMT at Del Norte Ambulance in April of 2016. Lyle is a natural leader and his experience in the field makes him a very valuable asset. Lyle is the EMT-B that all Paramedics want to work with. Many younger EMTs seek Lyle out for ideas, help, and guidance. Lyle is always upbeat, ready to help others, and prepared to take on tough assignments. 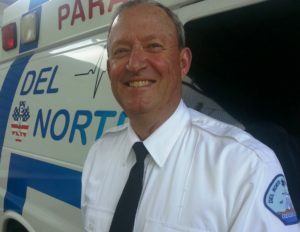 Lyle Armstrong is not only a terrific EMT, but he is also a terrific human being.